Elizabeth is a Legal Assistant in the Wills and Probate Department. She joined the firm in 1980. In December 2006 Elizabeth passed the STEP Foundation Certificate and followed this up in January 2008 by obtaining the Certificate of Performance in Specialist Paralegal Studies in Wills, Probate and Administration Practice. 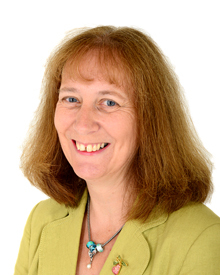 She specialises in Wills, probate and administration of estates, intestacy on death, trust administration and powers of attorney. Elizabeth is known for her empathy, sensitivity and understanding towards her clients. We wish to thank you most sincerely for your time and the efficient manner in which you have dealt with these somewhat delicate affairs. We have appreciated your genuine care, sensitivity and patience shown throughout. You helped make our visits to Stallard March & Edwards most pleasurable. On a personal note I would just like to thank you for your help and understanding at a time when I was perhaps not at my best! Your kindness and humour certainly put me at ease and gave me great confidence that all was being done with our very best interests! “I would just like to say that my father in law was very appreciative of your very sympathetic approach to the meeting, which was just the day before my mother in law’s funeral. This is a sentiment which I would echo”. "Just to say thank you Elizabeth for all you have done on the estate. You were held in very high esteem and he would have been very happy with how his wishes were carried out from his funeral to the settling of his estate." "I should just like to thank Elizabeth for the help and friendly advice you've given us in the numerous times we have visited your offices. It is like visiting a friend." "Thank you for your invaluable information and kindness. You made what I thought would be a difficult meeting a pleasure and this was incidentally agreed by a friend when you dealt with an estate for her."